Bryant – The Bulldogs will remember one of their own by hosting a day of golf at the Quidnessett Country Club come October 15. Bryant announced its plans for the special Archie Boulet Golf Tournament, which will honor the lasting legacy of long-time science professor and golf coach Archie Boulet who retired in 2011 and has since passed. Read more. Central Connecticut – The Blue Devils’ all-time leading shot blocker has taken her talents overseas to compete as part of the Dutch National Team. CCSU’s Kirsten Daamen, who will be a senior when the Blue Devils tip off the 2012-13 season this November, recently represented the Netherlands in a pair of hoops tournaments and checked in with CCSUBlueDevils.com to share her experiences. Read more. Fairleigh Dickinson – Former NCAA bowling champions Lisa Friscioni, Sara Litteral, Joely Carrillo, and Erica Perez hit the lanes at the USBC Women’s Championships in Reno over Memorial Day weekend. The four former Knights kicked off the summer by teaming up to take first place in the USBC’s Scratch Team event. Two of the four women, who attributed their success at the USBC competition to the experience they gained competing collegiately, are still involved in NEC bowling. Friscioni, a member of FDU’s 2006 NCAA title team, is an assistant coach for the Knights, while Erica Perez, who led the 2010 FDU team to the NCAA crown, spent this past season as an assistant at Adelphi. Read more. LIU Brooklyn – Long jumper Corryl Boyd took down the Northeast Conference championship record, only to top that performance three weeks later at the NCAA East Preliminary Round. Boyd long-jumped 7.73m to finish as the runner-up in the East and clinch a spot at the national championship meet. One of 24 long jumpers with hopes of capturing a national crown, the NEC champion will head to Des Moines from June 6-9. Read more. Monmouth – LIU long jumper Corryl Boyd won’t be the lone NEC champion competing for a national title in Des Moines this June. Monmouth senior shot putter Vincent Elardo will also contest the NCAA Outdoor Track & Field Championships after earning an 11th-place finish at the NCAA East Preliminary Round. Elardo, the 2012 NEC Outdoor MVP, exceeded the 60-foot mark to secure a berth in the final championship Field of 24. Read more. Mount St. Mary’s – Mount half-miler Gigi Gibilisco finished a few spots shy of the NCAA Championship cut at this past week’s NCAA East Region Preliminary Round, but the veteran runner isn’t walking way from his collegiate career empty-handed. Gibilisco was recently named the 2012 NEC Men’s Indoor Track & Field Scholar-Athlete of the Year and is also in the mix for outdoor scholar-athlete honors, which will be announced by the conference office later this summer. Read more. Quinnipiac – Tom Moore’s Bobcats will tip off the 2012-13 hoops season at the Paradise Jam this November. Quinnipiac will contest the annual eight-team event, which will begin on November 16 in the US Virgin Islands. QU’s first opponent hails from one of the NEC’s regional rival leagues. The Bobcats will open against MAAC member Iona, which received an NCAA at-large berth this past March. Read more. Robert Morris – RoMo, the Colonials’ loveable mascot, is looking for something to do this summer and the RMU Athletic Department is hoping you can help him. Robert Morris announced the start of the “RoMo Summer Tour,” a summer-long photo contest that will allow student-athletes, fans, and alumni to share accounts of their summertime activities/travels. So print out your photo on RoMo and take him along as you hit the road for some summer fun. Read more. Sacred Heart – The Pioneers have done it again. The NEC announced that Sacred Heart is the recipient of the Brenda Weare Commissioner’s Cup for the fifth straight year. Earning the NEC’s top annual prize, which gauges the success of conference members across all 23 of the league’s championship sports, SHU tied former league member UMBC for consecutive Cups. Read more. St. Francis (NY) – There are only 40 names on the list and SFNY athletic director Irma Garcia’s is one of them. The Women’s Sports Foundation (WSF), in collaboration with espnW and Women in Cable Telecommunications (WICT), unveiled the list of women who have made a significant impact on society through athletic competition during the forty years of the Title IX era. Garcia, a former head women’s basketball coach at SFNY, and the other 39 honorees will be recognized as part of a 40 FOR 40 event on June 21 at the JW Marriott in Washington, DC. Read more. Saint Francis (PA) – The Red Flash have built a tradition of success in men’s golf over the years, and now Derek Tyson (pictured below) is charged with building upon that foundation. 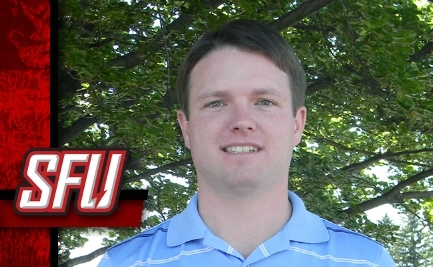 Saint Francis AD Bob Krimmel announced Tyson’s appointment as the new head coach in Loretto. Tyson, who takes over for Nick Wheeler, will be only the third coach in the program’s 42-year history. Read more. Wagner – Seahawks hoopster Marie-Laurence Archambault is doing big things this offseason – in Costa Rica! As she prepares for her senior season on Grymes Hill, the shooting guard is volunteering for Asociacion CREAR, an American non-profit organization that works with children and the community of Samara. Read more. Sacred Heart’s starters proved that for a second straight season in Norwich, posting a trio of complete game victories at the NEC Tournament and claiming the league’s automatic berth into the NCAA Championship field. Now, the Pioneers (25-30, 19-13 NEC) will attempt to ride that same pitching to success at the NCAA Regional in Raleigh. The back-to-back NEC champions will try their luck against regional site host North Carolina State (39-17, 19-11 ACC). It will presumably either be NEC Tournament MVP Troy Scribner (7-5, 4.04 ERA) (Overtime! Did You Know Moment? Scribner’s older brother Evan starred at Central Connecticut and is now with the Sacramento River Cats, the Triple A affiliate of Oakland A’s) or lefty Nick Leiningen (6-5, 4.12 ERA), who was also an All-Tournament Team selection, will take the ball for SHU in Game 1. Scribner pitched the Pioneers’ NEC Tournament opener with Leiningen following on Day 2. Regardless of who takes the ball, he will face a vaunted NC State lineup that is hitting .290 this year. Four of NC State’s everyday players boast batting averages no lower than .330, one of whom is first team all-ACC outfielder Ryan Mathews. The WolfPack’s big bopper has gone deep 14 times in 191 at-bats and is slugging .628. If NC State skipper Elliott Avent opts to throw his ace against Sacred Heart, then the Pioneers will face the only freshman in ACC History to nab the league’s Pitcher of the Year honor. Southpaw Carlos Rodon has not lost this season and sports a 1.59 ERA. With a shocker against NC State, Sacred Heart will become the first NEC team to win a NCAA Regional contest. The Pioneers went a combined 0-4 in their previous two NCAA visits (2006, 2011), but had Jacksonville on the ropes in 2006 before dropping a 4-3 decision. Should Sacred Heart not succeed against the WolfPack, the Pioneers will have another shot against either Vanderbilt (33-26) or UNC Wilmington (38-21). The Commodores, who were the SEC runner-up, and CAA champion Seahawks will face each other on Friday, June 1 prior to the Sacred Heart-NC State game. The first pitch of Game 1 will be at 2:00 pm with the Pioneers and WolfPack following at 7:00 pm. Considering the fact they play in arguably the nation’s top baseball league, the WolfPack are no stranger to stiff competition and pressure situations. NC State is one of five NCAA Regional site hosts who call the ACC home. Elliott Avent’s team topped Miami in its opening game of the 2012 ACC Tournament before bowing out with back-to-back losses to Wake Forest and rival UNC. It was only the fourth time this season that the WolfPack suffered two losses in a row and they have yet to lose three straight. In addition to the ACC’s top hurler (Carlos Rodon – 9-0, 1.59 ERA), NC State features a heavily-productive left side of the infield. All-ACC first team SS Chris Diaz leads all Wolkpackers with a .364 average and 23 two-baggers, while third baseman Trea Turner, a second team all-ACC pick, is hitting .345 with 64 runs in 56 games. Turner is also one of the top base-stealers in America, having swiped 55 bags in 59 tries. Then there’s Ryan Mathews and his 54 RBI in 52 contests. Pitching, power, and speed – NC State seems to have it all. 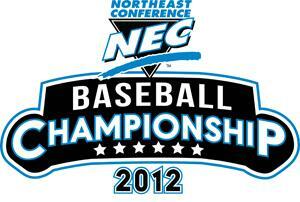 Three recent champions and one surprise comprise the field at the 2012 NEC Baseball Tournament. Monmouth, Sacred Heart, Central Connecticut and Fairleigh Dickinson will all contest the double-elimination event that awards its winner with an automatic NCAA Championship. The first three mentioned are the winners of the last three tournament titles. Monmouth won it all in 2009 with Central following in 2010. The 2011 NEC Tournament belonged to Sacred Heart and its pitching staff (the Pioneers allowed only 4 ER in three games). But for FDU, the NEC Tournament is a place the Knights haven’t visited since before the turn of the century. The Knights, who defied their last-place ranking in the NEC preseason coaches’ poll, have orchestrated a remarkable turnaround that has landed the program back in the postseason for the first time since 1999. While FDU makes its long-awaited return with skipper Gary Puccio at the helm, Monmouth, Sacred Heart, and Central will continue what has been quite a run. Dean Ehehalt’s Hawks are here for the fifth year in a row, while Nick Giaquinto’s Pioneers make a fourth straight appearance. Although Monmouth has been here 16 times, more than any other NEC program, it’s Charlie Hickey’s Blue Devils who currently own the longest streak of playoff appearances. Contesting the NEC Tournament for the seventh year in a row, CCSU has qualified for postseason play during 12 of Hickey’s 13 years in New Britain. The former Providence skipper and his Blue Devils were the last team to win a repeat title, although Sacred Heart has hopes of changing that this weekend. The Pioneers’ quest to repeat will likely hinge upon the success of its starting pitching. In 2011, the staff line for the tournament looked like this: 27.0 innings, 4 runs allowed, two walks, and 3 wins. The three starters – RHP Troy Scribner, LHP Nick Leiningen, RHP Kody Kerski — responsible for that line are all back wearing the Red and White. Although SHU’s arms have the greatest history of success here at the NEC Tournament, there will be a ton of eyes, especially those of MLB scouts, on Monmouth RHP Pat Light. The 6-foot-6 fireballer has struck out 97 batters and walked only 14 over 92.1 innings. He has been projected as a high-round draft pick by Baseball America. Central Connecticut has an effective No. 1 starter in Harry Glynne, but the Blue Devils M.O. this spring has been offense. The Blue Devils led the NEC in team batting average (.298) and scored a league-high 278 runs in 50 games. CCSU’s 29 long balls, 10 of which came off the bat of all-NEC first baseman Tyler McIntyre, were also a league-best. NEC Player of the Year Ryan Kresky leads a young FDU team into the four-team, double-elimination tournament, which will run from May 17-19 with an “if necessary” game set for May 20. FDU’s shortstop is one of a few upperclassmen on a roster that features 16 freshmen. Kresky, who like Light played his high school ball in New Jersey’s Shore Conference, won the NEC’s regular season batting title with a .377 average. He also led the lead in slugging and OBP. He was born in Summit and spent four years playing collegiately at the Jersey Shore, but Bryan Meredith’s big break came 2,400 miles west of the Jersey Shore. It started out as an ordinary night for the backup keeper on May 2 in the Pacific Northwest. He was on the bench as the Seattle Sounders hosted the LA Galaxy in a regular season MLS match. The Sounders, who had not beaten the Galaxy since 2009, found themselves holding a 1-0 lead, but facing a bit of adversity at halftime. While keeping LA off the scoreboard over the first 45 minutes, starting goalkeeper Michael Gpsurning managed to re-aggravate a hip injury and would be unavailable for the second half. Forced to go to his bench, head coach Sigi Schmid sent Bryan Meredith, a two-time all-NEC selection while at Monmouth, out onto the pitch. Fewer than three minutes into the second half, Seattle striker Fredy Montero showed Meredith the type of support every goalkeeper loves by connecting on a 35-yard scoring strike that doubled the Sounders’ lead. LA controlled possession for much of the second half, but their attempts on Meredith were few and far between. When US National Team captain Landon Donovan fired a shot on goal in the 62nd minute, the Galaxy’s lone shot of the second half, the 2011 NEC Tournament MVP was there to turn it aside. With Meredith producing a clean sheet in 45 minutes of work, Seattle held on for a 2-0 win. In a post-match interview, Schmid took time to laud his backup keeper. Only two days after Meredith’s MLS debut, it became apparent that the former Monmouth Hawk would be back in net for Seattle’s next contest against the Philadelphia Union. On May 4, the Seattle Sounders Official Blog, “Rave Green,” reported that the hip injury was going to keep Gspurning out for two to three weeks. As the blog reported, Schmid did not seem the least bit worried about the injury news because of his faith in Meredith. Thus far, Meredith has done nothing to shake, and everything to boost, his coach’s confidence in him. On May 5, Meredith and the Sounders posted a 1-0 victory over Philadelphia. 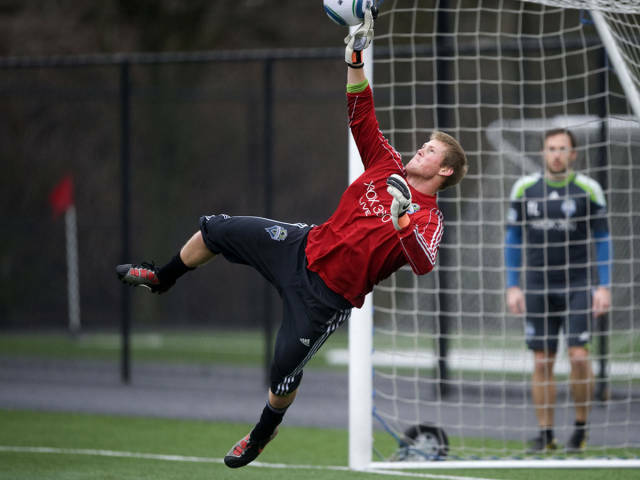 Then, on May 9, Meredith notched his second shutout in as many starts as Seattle defeated FC Dallas, 2-0, on the road. Meredith, who has kept a clean sheet intact throughout five halves of soccer, is set to make his third start when Seattle returns home to face Real Salt Lake on Saturday, May 12. The Sounders, who are 7-1-1 overall, are riding a five-match win streak and will have one of the winningest keepers in NEC history in net as they try to extend it. No stranger to success, Meredith compiled a 44-7-10 record while at Monmouth. Meredith, who earned 36 of those 44 victories via shutout, helped the Hawks capture four consecutive NEC regular season title along with two tournament crowns. During his senior season at Monmouth, the Hawks’ captain led the NEC in goals against average (0.70), save percentage (.842) and shutouts (11). Collegiate success doesn’t always translate into achievement at the professional level, but Meredith is making it happen. He won in New Jersey and now he’s doing it on short notice in Seattle. The competition may be tougher and his new home is nearly a whole continent away from the Jersey Shore, but the results have been the same for Bryan Meredith. Bryant is only four games away. The Bulldogs are 1.0 game up on Monmouth for first place in the NEC Baseball standings with four games remaining on the regular season schedule. Bryant’s next four games could yield the program’s second regular season title in the last three years, but at the very least, the final four games of the 2012 season will put an end to four years of waiting. Bryant joined the Northeast Conference’s ranks back in 2008, trading its Division II status for NCAA Division I membership, but not without a short-term cost. As all NCAA members reclassifying from Division II to Division I must do, Bryant had to endure a four-year wait. The Bulldogs had to complete a mandated four-year reclassification process before becoming eligible to compete for a NCAA Division I national championship. Over the last four years, the Northeast Conference has done everything in its power to make the Bulldogs feel at home in their new digs. Helping ease the transition, the NEC immediately plugged Bryant into its conference schedules across the board. For the last three academic years, the Bulldogs have participated in all of the league’s general and sport-specific awards programs. Still, Bryant remained ineligible for NEC postseason play as per its NCAA reclassifying status. Four games from now, however, that reclassification process will finally be completed as the last of the school’s spring sports teams closes out the 2012 season. No matter what happens over these final four games, the Bulldogs will have to wait until 2013 for a possible NEC Tournament debut. Still, these next four games hold a heavy importance for Bryant baseball. Just ask senior Jamie Skagerlind. The Bulldogs’ first baseman, and latest member of the 200-hit club, had one thing on his mind during a post-game interview on Sunday, May 6. Disappointed after a loss in the finale made Bryant settle for a series split with Monmouth, Skagerlind attempted to put the situation in perspective. While Skagerlind and Co. will be striving for first, their opponent will be fighting for its postseason life. Wagner is 1.0 game out of the final playoff spot as it heads to Smithfield. The Bulldogs (21-7) have won exactly 75 percent of their NEC games in 2012 and can guarantee themselves at least a tie for first place (regardless of what happens in Monmouth’s series with Sacred Heart) by taking three out of four from Wagner this weekend. Such a result would certainly be a nice send-off, and not just for the team’s seniors like Skagerlind. It would be a good way to send Bryant’s entire baseball program into a potentially bright future as a full Division I member. Monmouth clinched a spot in the NEC Tournament by earning a split in last week’s series with Bryant. The postseason berth is just another bullet point on a long list of achievements for the program under long-time skipper Dean Ehehalt. In 18-plus seasons at Monmouth, Ehehalt has amassed 518 victories and seven NEC regular season crowns. In what will be the team’s 16 NEC Tournament appearance under Ehehalt, the Hawks will be looking to lock up their first NCAA appearance since 2009. Staff aces Pat Light (Monmouth) and Peter Kelich (Bryant) were both chased from their latest starts after six innings. They only surrendered five earned runs between them, but it was uncharacteristic outing for both men. Light struck out six and only walked one but hit three batters. Kelich surrendered seven hits and balked twice. Still, both men remained amongst the NEC’s top-5 ERA leaders. Kelich entered the final week of NEC regular season play at 8-2 with a league-low 1.88 ERA. Light is 7-3 with a 2.81 ERA, but his most-impressive credential, other than his mid-90s fastball, may be his 0.98 WHIP. Light, who has struck out a conference-high 87 batters, has issued only 12 bases on balls. After throwing 4.0 innings of one-hit relief in Bryant’s 12-inning triumph over Monmouth on May 4, sophomore Sal Lisanti earned recognition from College Baseball 360 as a “Primetime Performer.” Lisanti, who has appeared in 23 games out of the bullpen, owns a 1.67 ERA and has seven saves this season. Read more. … With Ocean State rival Rhode Island atop the rankings, Bryant found itself second in the latest edition of the New England Intercollegiate Baseball Association Coaches Poll. Read more.